I came into a bit of cash and spent it on some self-designed goodies at Zazzle. 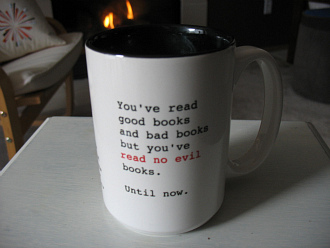 Ah, author-generated marketing! No, not really. This sort of thing is too expensive to be part of any sane business plan for promotion. But spending money on swag like this is a chance to affirm your faith in your ability as a writer and your certainty in your future success. They’re conversation pieces. Your friends will see them and ask what the hell you are up to. And you owe it to yourself to get comfortable about sharing your writing progress with your buddies and colleagues. And they are wicked fun. 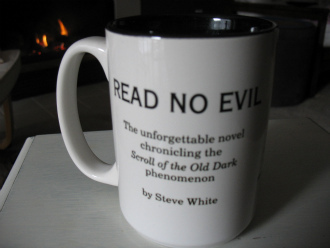 Here’s a mug with some tease copy for the novel I’m writing now. Do you ever wake up with cool descriptions of your novel in your head? I do, and I write that stuff down. 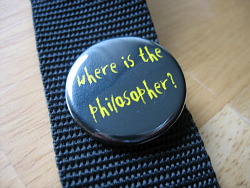 Here’s a pin with a graffiti catchphrase from the novel. The main character keeps finding this scratched into park benches and spray-painted on bridges, etc. This is the biggest, cheesiest hack in all my html history. Why the hell can’t I space these stupid pictures properly? Argh! 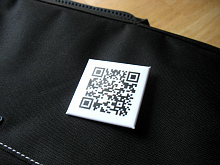 And this mysterious glyph on my book bag is a QR code, a two-dimensional bar code that usually encrypts website URLs, although they can encrypt any text (such as your latest short story). I’m strangely drawn to them — I think they look like Egyptian hieroglyphics. If you have the right app installed, you can point your iphone at one, and be taken to a website. This one, of course, sends you here. You can create them for free here, and proofread your work here. 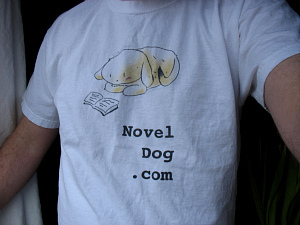 Lastly, here’s a t-shirt I can wear to Write On The Sound conventions and NILA Residencies. Wearing my blog on my sleeve, more or less. The next time your trial version of Microsoft Word expires and The Man wants your money, tell him to buzz off and take a look at www.openoffice.org. I do most of my writing with Openoffice. Here’s a review from PC Mag and another from Computerworld. Don’t reinvent the wheel. That’s what they say. If you’ve got a great idea for a novel about an orphan who learns that he’s a wizard, you may want to have a beer and rethink things. But there’s no escaping it. You have to know what novels have been written that are similar to your idea. But you have no titles or authors to search for, so Amazon is useless. How do you find them? Try the search function at Library Thing. You’ll see an entry field for works, another for authors, but then, something really cool — tags. Suppose you’re thinking of writing a police procedural about a jaded cop who has to deal with a gargantuan medieval dragon in the sewers of New York. Has it been done? Will it remind agents and publishers of something that came out last year? I typed “cop” and “dragon” in the tags field. Library Thing zipped through its 4.5 million logged titles for any tagged both “cop” and “dragon” by its members. Zero hits! Then I tried “police” and “dragon” and came up with one hit: Guards! Guards! by Terry Pratchett. I’d better take a look at that, to make sure I don’t step on Terry’s toes. I tried “cop” and “dragon” in Amazon’s book search and got 113 hits, including non-hits like Tom Clancy’s The Bear and the Dragon (#4) and Naomi Novik’s Throne of Jade (Temeraire, Book 2) (#8). Lots of false positives to sort through. I tried it again for “New York” and “dragon,” getting no hits on Library Thing and two thousand useless hits on Amazon (the first was a guide on dragonflies, published by the New York Academy of Sciences). Good enough for me. I’m checking the Pratchett book (I don’t read enough of him, anyway), and putting “Cop vs. Dragon” in my novel queue. Some type on in silence. I used to need total silence, the better to concentrate my sweaty furrowed brow on my writing. Lately (okay, since Nanowrimo), I’ve been writing to music. But it can’t be any music. It has to be just right. The wrong groove can distract, make your chase scenes dry, your exposition dull, your love scenes comic. I searched for a long time for the right tunes. I’ve made playlists on Youtube, and found favorite bands that no one’s heard of on Jamendo. But the winner, hands down, is Pandora Radio. … among others. I don’t know what most of it means, but Pandora seems to think I like that sort of thing. They could be right. Give a listen, let it speed up your fingers, and may your writing have a tight kick sound and a prevalent use of groove.